Burglar alarms range from an audible only system (bells only), where if the alarm is activated the internal and external sounders ring, to a fully monitored system, we use a number of different communication methods depending on your circumstances and requirements which will send signals to an alarm receiving centre that will dispatch the local police and contact keyholders. 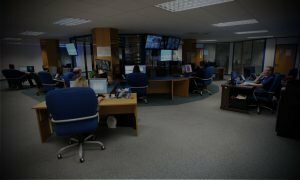 We provide 24 hour monitoring for all types of alarm systems through our carefully selected Alarm Receiving Centre (ARC). We monitor systems to protect you in case of an Intruder, Personal Attack or Fire. If your alarm system is activated and a confirmed signal is received by our ARC (subject to the system response level), the Police will be automatically notified and will respond. A confirmed signal means that the system must generate two independent alarm activations before the call can be passed on for a Police Response. Our ARC controllers will contact the premises to verify the activation. If the private passcode for the premises cannot be confirmed within a set time, the Police response will be confirmed to continue. The ARC will also contact keyholders nominated by the client to advise of an alarm activation of any kind. Clients who do not require Police response but would like the added security of either themselves or their nominated keyholders being contacted following a alarm activation, can have the system more or less designed to meet their own requirements, subject to insurers approval if necessary. Temporary monitoring is also an option – this option is only available through a digital communicator connection. If you are unable to provide private keyholders, Telecom Security can help you identify a keyholding company that meets your needs. Some clients prefer to have their intruder alarm system with keyholder response only but want the extra peace of mind of being able to reach the Police in an absolute emergency. You can opt to have the Panic Button only connected for Police response.